Fenghuang, praised as "the most beautiful town in China", is a small county town renowned for its natural beauty, rich history, colorful ethnic customs, and photogenic night scenery. 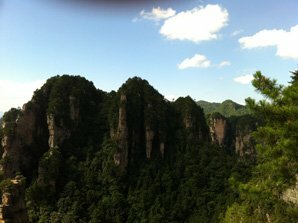 It is well worth a night&apos;s stay to combine it with your trip to Zhangjiajie. Entry: free, but a fee is required for some attractions in the ancient town. 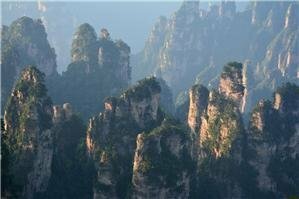 Location: It’s about 430 kilometers (6 hours’ drive) from Changsha, and 250 kilometers (4 hours’ drive) from Zhangjiajie. This town, with a history of over 400 years, boasts rich culture and natural beauty. There are 20 ancient streets, dozens of ancient lanes, and over 200 ancient residences there, which display the architectural styles of the Ming and Qing dynasties. The ancient town is home to the Miao and Tujia ethnic minorities, with their unique ethnic languages and customs. It is a guidebook for people to discover the previous way of life in the pre-modernization period. It was added to the UNESCO World Heritage Tentative List in 2008. Pingyao, located in central Shanxi Province, is a town developed by merchants and is renowned for its commercial culture. It is an outstanding Han town with architecture from the Ming and Qing dynasties. You will visit China’s first bank and many magnificent residences built in ancient traditional styles. Lijiang, a former trading town and a stop for traders carrying goods, was created by the Naxi ethnic minority who followed the Dongba culture. You will see centuries-old architecture and an orderly system of waterways and bridges. Fenghuang perfectly combines mountains, water, and the cultures of different ethnic groups, such as the Miao, Tujia, and Han. You will see unique wooden houses called Diaojiaolou and enjoy natural beauty. The best way to see the town is by walking around it. You can visit historical wooden buildings, have a close-up experience with the local people, and immerse yourself in its cultural atmosphere. You can enter narrow alleys paved with flagstones and decorated with lanterns, and walk around to grab some souvenirs and snacks from stalls lined along the streets. You can see some local elderly women wearing traditional costumes and selling their handmade souvenirs on the roadside. The nighttime scenery in the town is beautiful, with old buildings nicely illuminated along the river. The town is a hive of activity with all the nightlife. You can find a café beside the Tuo River to enjoy some free time. It is a different place in the morning, being very serene and peaceful. The Tuo River, running through the heart of the town, is the mother river of the ancient town. 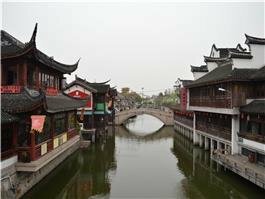 Along the river you will see unique wooden houses called Diaojiaolou (吊脚楼), which were constructed on stilts to keep them safe from the spring floods. They are typical Miao buildings with a history of over 100 years. When seen from a distance, the houses look like they are standing on the river. Taking a boat trip along the Tuo River is a great way to have a better view of the houses. The best time is in the early morning or in the evening. You may see locals using the river water to wash their clothes as well as vegetables. Boats operate regularly upstream, running from the pier near the town’s North Gate to Wanshou Temple. 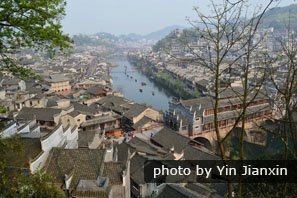 Fenghuang Ancient Town&apos;s history can be dated back to the Spring and Autumn Period (770–476 BC). The town as you can see it now was built during the 43-year reign of Emperor Kangxi of the Qing Dynasty in 1704, and the ancient buildings displaying the distinct Qing Dynasty style are well preserved. Its fairly long history endows it with over 300 cultural heritage sites. These include Huang Si Qiao Castle (黄丝桥古城), the best-preserved stone castle built in the Tang Dynasty in 687, and Xiangxi Border Wall, which was built during the Ming Dynasty (1368–1644) and is highly praised as being China&apos;s Southern Great Wall. 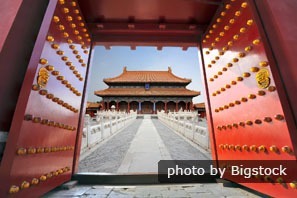 There are also famous ancient buildings including Longevity Palace (万寿宫), Chaoyang Palace (朝阳宫), Hong Bridge (虹桥), the East Gate Tower (东门城楼), and Wanming Pagoda (万名塔). If you are interested, you can join in a bonfire party beside the river at night. It is a way to experience the traditions and culture of the Miao people. It usually starts from 7:30pm and ends at 9:30pm. The cost is 50–80 yuan. Fenghuang is an ethnic minority group area, and the Miao ethnic minority takes predominance in its numbers. If your schedule allows, you can spend half a day visiting a Miao village. A recommended village is Tehang (德夯), where the Miao customs, living style, and festivals are kept intact. In the village, you can see typical buildings, listen to traditional songs, and taste the local food. 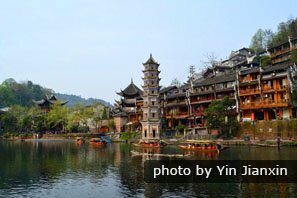 Fenghuang has a subtropical monsoon humid climate with four distinct seasons, sufficient rainfall, and abundant sunshine. July is Fenghuang’s hottest month with an average daily temperature range of 23 °C (73 °F) to 32 °C (90 °F). January is the coldest month with an average range of 1 °C (34 °F) to 8 °C (46 °F). The climate is similar to nearby Zhangjiajie’s weather. The best times to visit are considered to be spring and autumn. The period from April to June is the rainy season. The scenery after it has rained is like a traditional Chinese painting. The period from September to November is also a great time, when the heat and rains of the summer have subsided. Daytime temperatures are still warm while nights are cooler. In December and January, temperatures are cold and snow is possible, but there are fewer visitors. Domestic tourism during the national holidays in early May and October results in price rises and busier sites. It is advisable to book in advance. 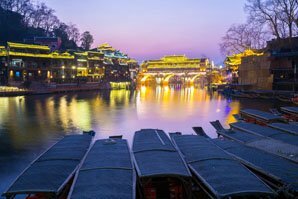 Fenghuang is a small county and getting there is not as convenient as getting to big cities. 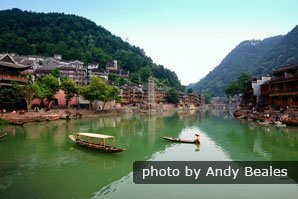 There is no airport or train station in Fenghuang County, but you can get to it via nearby cities. If you want to take a flight, you can choose to land at one of the following cities. Tongren, a city in Guizhou Province, is about 60 kilometers east of Fenghuang County. The nearest airport is Tongren Fenghuang Airport, which is only 34 kilometers away from Fenghuang County. You can take a tourist bus (7:30am–4:30pm) from the airport direct to the town, taking about 1 hour. Fly to Zhangjiajie Hehua International Airport and then get to Zhangjiajie City Bus Station for a direct bus to Fenghuang Bus Station. The trip costs 80 yuan per person and takes 5 hours. Fly to Changsha Huanghua International Airport and then take the airport shuttle bus to Changsha West Bus Terminal or South Bus Terminal to take a long-distance coach to Fenghuang. It costs about 150 yuan and takes 6 hours. If you travel by train, you can arrive at one of the following cities first and then take a bus to Fenghuang. Jishou Railway Station is the nearest train station, being about 50 kilometers from Fenghuang. Direct buses are available, which run from 7:30am to 4:30pm daily and take about 1 hour. Huaihua is about 100 kilometers from Fenghuang. If you arrive at Huaihua Railway Station, take a taxi or public bus to Huaihua West Bus Station for direct buses to Fenghuang. It takes about 1½ hours and costs 40 yuan. If you arrive at Huaihua South Railway Station, take a direct bus to Fenghuang from the bus station near the railway station. Take a direct bus to Fenghuang from Tongren North Bus Terminal, opposite Tongren Railway Station. The duration is about 1½ hours and the fare is 30 yuan. 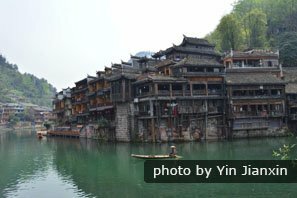 There are many accommodation choices in Fenghuang Ancient Town, ranging from hotels to hostels. We recommend you stay in a hotel or hostel along the Tuo River. If you want to experience a stay in a typical Diaojiaolou building, you can choose a hostel or inn downstream of the river. The food in Fenghuang is spicy, and you&apos;d better tell the waiter or waitress that you don&apos;t want too much chili in your dishes when ordering your food. If you want to try some local dishes, here are some recommendations: a duck cooked with blood and sticky rice (血粑鸭), sour soup of the Miao people (苗家酸汤), and smoked pork (腊肉). Ginger sugar is a popular snack in Fenghuang. It is a special sugar made from sugar and ginger, allowing you to taste both sweetness from the sugar and the spiciness of the ginger. 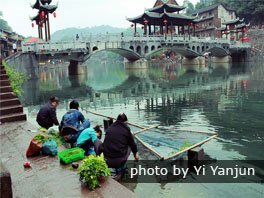 The people in Fenghuang are good at handicrafts, and the most famous handicrafts are batik paintings and Ox horn combs. Batik paintings are a symbol of the Miao nationality&apos;s handicrafts. If you are female, you can buy the local blue Miao skirt there, giving you a special experience when walking around the ancient town. Those who are interested in ancient towns in China often visit Fenghuang Ancient Town after their Zhangjiajie tours. Here is a sample tour for your inspiration: 7-Day Changsha, Zhangjiajie, and Fenghuang Ancient Town Private Tour. Our tours are customizable — tell us your interests and requirements and we will help you to tailor-make a tour.